Practicing yoga throughout your pregnancy can be one of the most empowering, enlightening and inspiring experiences imaginable. The practice vastly supports your own health and wellness, easing the wretched leg cramps, lower back pain and swollen feet associated with carrying a baby. Moreover it also deepens your connection to your baby, while teaching you breathing techniques and movement rituals to assist you throughout your labour. Whether you are attending a specific prenatal yoga class or a all-level yoga class with your growing belly, the overall experience can be dramatically transformed by applying some or all of these tried and true tips from pregnant yogi-mamas. 1. Talk to your yoga instructor before class. Telling your yoga instructor about your pregnancy, what trimester you are in, and any complications or reservations you have about your yoga practice, enables your instructor to fully support you during class. 2. Practice near the door. In case of emergency – nausea, bathroom breaks or otherwise – avoid the hassle of scrambling through the room to exit and set up your mat near the exit. 3. Avoid heated classes. Pregnant women are advised to avoid increasing their body temperature too much which may increase neural tube defects and risk of overheating. 4. Use Props. More than ever, placing blocks under your hands in standing forward folds or sitting up on a bolster in seated poses can add a layer of support that your growing belly and rounding spine will love you for. 5. Go pee. There tends to be a shame or guilt around leaving the studio mid-class to go pee, but consider that there is a little human bearing down on your bladder all the time, and by holding it in you run the risk of UTI or leakage. You will enjoy your yoga practice far more if you take the time to step off your mat and hightail it to the bathroom. 6. Avoid pain and pressure. If you practiced yoga regularly before pregnancy, many of the asanas and breath work are fine to continue practicing. However, it is wise to skip certain poses that trigger pain, shortness of breath, high blood pressure or dizziness. Some recommendations to avoid include: inversions, intense abdominal work, deep back-bending, belly-down postures, deep closed twists, breath retention or breath of fire. 7. Plan your food and drink. If you have not already gotten into the habit of stashing your bag with fruit and crackers and granola bars, now is the time to do so. While traditional yogis resist eating hours before their yoga practice, my body forced me to abandon this rule during pregnancy. Especially in the first trimester, if you body is yearning for a snack, indulge. For hydration, experts recommend 8-12 glasses of water each day, with one more class for every hour of exercise. 8. Be mindful of adjustments and essential oils. While many of us adore the sensation of aromatherapy application or hands-on adjustments during yoga, it may be better to opt out during your pregnancy, unless you are with an experienced prenatal teacher. Various essential oils have adverse effects during pregnancy, while an unexperienced hands-on adjustment may risk throwing you off balance. 9. Listen to your body. More than ever, honour the invitation of deep inner listening. Slow down when you tire or lose connection to your breath, give yourself permission to opt out of poses that do not suit you, and take breaks as necessary. This is especially important when attending general classes where the group pressure to stay synchronized threatens to mute that inner voice. Your teacher and fellow students will compassionately understand why you are adapting the poses, twisting in the opposite direction to create an open twist, or doing cat-cow instead of cobra in your vinyasa. If you find the pressure too much to handle, it may be time to switch to prenatal specific classes. 10. Explore mantras and chanting. While chanting was not a regular part of my yoga practice pre-pregnancy, I found that every time I chanted OM or sang mantras, my baby danced inside my belly, and I felt inspired and reinvigorated. In Kundalini tradition, chanting the Adi Shakti mantra invokes the power and strength of the divine feminine and creative force. It is said to connect to the highest manifestation of the mother. In a 2005 study published in the Journal of Alternative and Complementary Medicine, it was concluded that women who practiced yoga regularly during pregnancy were less likely to have preterm labor to or deliver a low-birthweight baby. 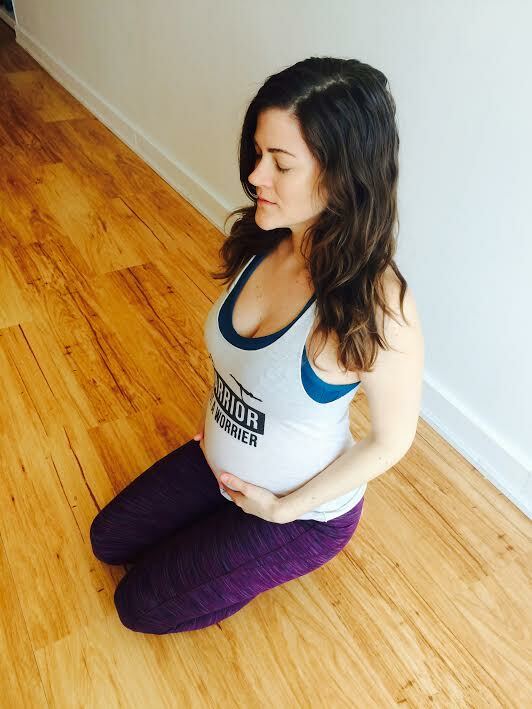 Practicing yoga during pregnancy can become a shining light during otherwise trying times. The practice can relieve stress, tension and physical pain while building community and preparing your body and mind for the process of labour. As a yoga teacher, prenatal yoga teacher and pregnant yogini, the aforementioned tips come from my personal experience and the experiences of my students. Ultimately, the choices you make during pregnancy are up to you (and your doctor or midwife). For further support on your prenatal yoga journey, visit www.ashleyholly.com or follow my prenatal yoga journey on Instagram. This entry was posted in toronto studio. Bookmark the permalink.